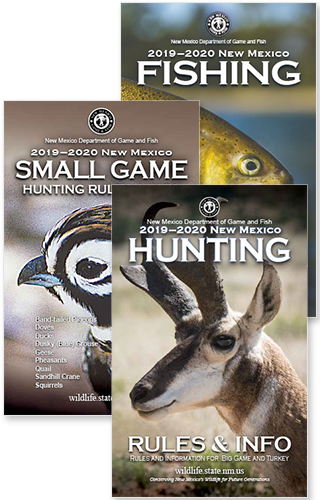 Click the tab headings below to learn more about Hunting License Requirements & Fees, as referenced by the 2019-20 New Mexico Hunting Rules & Info booklet. See also Disability, Age, & Military Benefits. Each individual purchasing a license or applying for a draw hunt and every student registering for a hunter/bowhunter education class, must have an account with a Customer Identification Number (CIN). Establishing an account is free. Accounts can be set up online or by telephone at: https:// onlinesales.wildlife.state.nm.us or 1-888-248-6866. Deer and elk hunters may choose to E-Tag their animal rather than receive and carry a paper license/tag. Deer and elk hunters must choose whether to E-Tag or receive a physical tag when purchasing or applying for their deer or elk license(s). If you choose to receive a paper license/ tag, you cannot later use the E-Tag option. E-Tags require the hunter to download the E-Tag app to their mobile phone and save their license in the app. Upon harvesting an animal, hunters will be required to immediately E-Tag the animal using the app. When you use the app, you will receive an E-Tag number with your CIN and the date of kill. You must write the E-Tag number, CIN and date of kill on a durable material (e.g. duct tape or flagging ribbon) in permanent ink and attach it to the animal (see Tagging Instructions, pages 31–32). The app will work even while out of service as long as you have saved your deer or elk license prior to leaving cell service. Hunters must be able to show their license on their phone. Hunters choosing to E-Tag must still submit a harvest report. Everything needed to hunt is now available in one convenient document. You purchase your license online, by telephone or at an NMDGF office. The license/tag will include the Game-hunting License, any stamps purchased, the big-game license, carcass tag and an antler/horn tag (depending on species and bag limit) and/or a second tag (cougar and spring turkey). Licenses/tags will be mailed to all successful draw hunt applicants, unless the E-Tag option is chosen for deer or elk. Telephone or online purchases for javelina and private-land Barbary sheep, deer, elk, oryx and pronghorn licenses must be made at least 14 days prior to the start of the hunt to allow time to mail the license(s)/tag(s). License(s)/tag(s) will be mailed to the address provided by the customer for each species. Customers may obtain a duplicate tag in person at any OTC license vendor or NMDGF office. Duplicate license/tags will be charged a $6 fee. If obtained at an OTC license vendor, both a printed license and separate tag will be required. If a duplicate tag is obtained, the original tag number will be invalidated. It is illegal to use an invalidated license/tag. See pages 31–32 for more information and instructions for tagging. The single document option will not be available for big-game licenses and duplicate tags purchased at OTC license vendors. Both a tag and a printed license will be required. All big-game or turkey hunters must possess a valid license, and permit if applicable, for the species and hunt type in which they will participate. If the E-Tag option is chosen, hunters must possess an electronic copy of their license, and permit if applicable, and must produce this upon request by an officer. All big-game or turkey hunters must possess a Game-hunting License. All big-game and turkey hunters must possess a carcass tag(s) for each species hunted, unless the E-Tag option is chosen. All hunters, trappers or anglers on any Forest Service or Bureau of Land Management lands must possess a Habitat Stamp. See exceptions below. All hunters, trappers or anglers 18 years and older must possess aHabitat Management & Access Validation. See exceptions below. All hunters 17 years of age and younger must possess a Hunter Education or Mentored Youth number. All hunters on private lands must possess written permission from the landowner (page 27). Pursuant to the New Mexico Inspection of Public Records Act, Sections 14-2-1 et. seq. NMSA 1978, all information provided when applying for licenses and permits is public record and must be disclosed to anyone when properly requested except as provided by law. A Habitat Management and Access Validation (HMAV) must be purchased and possessed by all hunters, trappers or anglers, except individuals 17 years of age and younger, resident anglers 70 years and older (free fishing license) and 100% disabled resident veterans in conjunction with privileges covered by the Disabled-Veteran card. This once-per-license-year fee is used to: lease access to private lands for public use; provide public access to landlocked public land; and provide improvement, maintenance, development and operation of State Game Commission property for fish and wildlife habitat management. The HMAV will automatically be added to the shopping cart with your first purchase of a hunting, fishing or trapping license if required. Where is a Habitat Stamp Required? See the Habitat Stamp page (under Conservation). Hunters, trappers and anglers must purchase and possess a current Habitat Stamp to use U.S. Forest Service and Bureau of Land Management (BLM) lands in New Mexico, except trappers or anglers 11 years of age and younger, resident anglers 70 years and older (free fishing license) and 100% disabled resident veterans in conjunction with privileges covered by the Disabled-Veteran card. Only one stamp is required each license year for these lands. The stamp is not required on other public property, or on private property. The stamp is not required in Unit 28, a predominately BLM property under military withdrawal. Funds from the sale of Habitat Stamps are used to improve wildlife habitat. All hunters, trappers and anglers are encouraged to purchase a Habitat Stamp. Licenses, tags, stamps and validations are available online: www.wildlife.state.nm.us, by telephone: 1-888-248-6866, at NMDGF offices and over-the-counter (OTC) from local vendors. Information and requirements for the Habitat Stamp and Habitat Management & Access Validation are described on page 9. Please note, before March 25, Game-hunting Licenses and stamps for the 2019–20 season may only be purchased through the draw application process. Restrictions may apply for online big-game license purchases. Licenses and permits can be printed on standard paper, but all big-game and turkey hunters must obtain a tag(s) from the department or a license vendor prior to hunting or have chosen the E-Tag option for elk or deer. Private-land elk license fees see page 69. Also required for nonresident trapping of coyotes and skunks. Does not include trapping pages 34 Nongame, 124 Trapping License). Mandatory for hunting, angling or trapping on all Forest Service and Bureau of Land Management properties. For age requirements and exceptions, see page 9. Mandatory for hunting, angling or trapping. This validation does not replace the Habitat Stamp. For age requirements and exceptions, see page 9. One dollar ($1) vendor fee will apply for all purchases. 1 Valid for small game. 2 Valid for small game and fishing. 3 50% N.M. Resident Military/Veteran Discount does not apply. (See page 15 for age requirements). Before March 25, game hunting licenses, game hunting and fishing licenses and stamps for the 2019–2020 season are unavailable through license sales and only may be purchased through the draw application process. A United States citizen who has resided in N.M. for a period of not less than 90 days immediately preceding the date of application (or purchase) for the license, has been domiciled in N.M., and has not claimed residency elsewhere for any purpose. Temporary or seasonal residents and home owners, who maintain a primary residence outside of N.M., do not qualify for resident licenses. A citizen of another country who is legally in the United States and has actually lived in N.M. for at least 90 days immediately preceding his/her license application (or purchase). A student, not otherwise entitled to claim residence, who is attending any educational institution in N.M., has attended and actually has lived in the state for at least one full semester immediately preceding the application (or purchase) for a license. Students must present a certificate or letter verifying their enrollment and attendance from the proper authorities of the educational institution. A member of the U.S. military, not otherwise entitled to claim residence, who is permanently assigned to a military installation located within N.M. and who presents with his/her application a certificate or letter that verifies the military assignment and is signed by the commanding officer. The spouse or dependent of such person, living within the same household and similarly certified by the person’s commanding officer may also purchase resident licenses. A member of the U.S. military who is officially stationed at Fort Bliss and who presents a certificate or letter to the department that verifies the military assignment and is signed by the commanding officer, prior to the application deadline. This applies only for draw-hunt licenses on Fort Bliss. Fort Bliss personnel must pay nonresident license fees for all other hunts. The 50% resident military and veteran discount does not apply. Without the purchases of licenses by hunters, trappers and anglers, and the taxes derived from the sale of sporting equipment and fuels for boating, the conservation of fish and wildlife would not be possible. Through the USFWS Sport Fish and Wildlife Restoration Program, excise taxes for fishing equipment, motorboat fuel, sporting arms, ammunition and archery equipment provide the funds essential to the conservation efforts of wildlife and sport-fish management agencies. These funds support many important projects in New Mexico, including bighorn sheep and Gila trout restoration, game-species management, fish-hatchery operations, lake renovations, waterfowl-habitat maintenance, and much more. Remember every time you buy a license, ammunition or hunting and fishing gear you’re part of the most successful user-based wildlife conservation program in history!